Fasting is an ancient healing method. Fasting unleashes the body’s own healing power with time and nothing to digest for a period of time. It provides the organ’s such as liver, kidneys and the lymph nodes to release waste. My previous blog on fasting provided information on the benefits of fasting and what to be cautious of. This blog is all about different types of fasting and some beneficial tips on how to successfully get into a fasting regime. This type of fasting may seem extreme to some as it means to abstain from both food and water for certain periods of time. For centuries, dry fasting has been practiced for religious and spiritual purposes. This is known as being absolute fasting. An example of this would be Ramadan, where Muslims fast from dawn to sunset for a month. Dry fasting puts the cells into a stressful environment where the healthiest ones survive. In fact, a study on a group of people during Ramadan had significantly less pro-inflammatory cytokines, blood pressure, body weight, and fat percentage. In dry fasting, the body does not eliminate toxins through urine, bowel, and sweat or through elimination organs such as liver, kidneys, and skin. Instead, the toxins are burned inside of the cells. The body destroys or cleans our damaged cells and regenerates new cells. This is like the `survival of the fittest` as only the healthiest of the cells survives during dry fasting. Although the production of stem cells reduces in the body with age, with dry fasting stem cells are released into the blood more than usual. It has been said that cysts and benign tumors dissolve during dry fasting as the body eliminates its unhealthy cells for its own survival. Liquid fasting is when the body is given only liquids during the fast. One of the best ways to experience success is through fasting by only drinking water for a period of time. This is one of the oldest and simplest forms of fasting as it provides the most health benefits in a short period of time including, lowering blood pressure and balancing blood sugar. During a water fast, the process of autophagy occurs – an internal recycling program where old cells/debris/toxins are cleaned out through lysosomes. A water fast is done for about 24 hours up to 72 hours, with no food and only drinking water, about 2-3 liters per day. When completed, slowly introduce food in the form of smoothies and small meals, working your way up to larger meals. Water fasting can protect against cancer, Alzheimer’s disease, heart condition etc. Today “Juice Cleanse” is a popular way to detox the body. Vegetable and fruit juices are prepared in mixes to create trendy juice cleanses. During juice fasting, the body is abstaining from solid foods and receiving a huge supply of micro nutrient support. Any type of fruit or vegetable juice can be consumed during this fast. During the time of juice fasting, the body’s digestive system gets a rest even though the body gets vitamins, minerals and antioxidant. Juice fasting can assist with weight loss, increased energy and enhancing mood. This type of fasting alternates between periods of fasting and periods of eating. The fasting period is either 16:8 (16 hours fasting, including overnight, with 8 hours of eating), or 5:2 (fasting for 2 days, eating for 5 days). This type of fasting removes the body’s reliance on using carbohydrates for fuel and instead promotes the breakdown of fat for fuel. It also triggers changes in various hormones such as insulin and growth hormone. When you eat multiple meals a day, insulin is released each time to deal with blood sugar spikes. But when you go long periods of time without eating, such as intermittent fasting, this triggers fat burning instead. In terms of growth hormone, it is also involved in fat burning and muscle protection. Studies show that intermittent fasting can extend life expectancy, reduce inflammation and fat, and improving cognitive function. Food restriction or fasting is known to upregulate autophagy in various organs including the liver. Autophagy, the method by which your body cleans out damaged cells and toxins, helps you regenerate newer, healthier cells. Autophagy is a defense mechanism against many things such as infections and neurodegenerative diseases, and studies show that autophagosome numbers are increased in cortical neurons after food restriction or fasting. I will be writing more about Autophagy, its benefits and how to turn up the body’s autophagy state in my upcoming blog. In order to combat the negative impact of fasting, one must prepare the body for fasting. 1. Start with a generally clean diet and eliminate junk food, sugar, white flour, canned foods, and cured meats. 2. Increase your intake of vegetables by eating a minimum of one cup with every meal. 3. Do not snack between meals. Drink water or herbal tea if desired. 4. Start with intermittent fasting. 5. Be aware of your food sensitivities or allergies and ensure to remove them for a week before starting your fast. 6. You must speak with your primary medical care practitioner if you are taking medicine, on a certain diet, or have a chronic health condition. As promised last week here are the two recipes for impeccable vision health. 1. Dice and chop the spinach, mango, carrots, and kale. 3. Blend until smooth. Pour in a glass and drink fresh.  Dried Calendula or Marigold, petals – 1 Tsp.  Turmeric – ¼ tsp.  Ginger Juice – ½ Tsp. 1. Boil 2 cups of water and add amla, calendula, saffron, turmeric and nigella seeds. 2. Brew them for 15 to 20 minutes. 3. Strain the liquid in a mug and add the orange and ginger juice. world around us and the people we care for. Therefore, we must take good care of our eyes. condition Retinitis Pigmentosa (RP). It is a complex disease that requires a lot of managing. Blurry Vision: Lack of sharpness of vision with, as a result, the inability to see fine detail. Fatigued Eyes: Due to many hours spent in front of the computer, phone, TV or other devices. fats, food additives, food colors, and toxic chemicals. 3. Adding foods that are organic and pesticide-free fruits and vegetables. tomatoes, papaya, oranges etc. are excellent for vision health. 5. Adding leafy greens meals once a day is utmost important for Vitamin A and B Vitamins. leafy green called “laal shaag” was extremely popular for vision health. or algae oil. A 1000 mg will change your vision health. 7. Adding turmeric to food or as a tea can boost the vision health and the immune system. share in another blog post. herbal remedy of choice. Speak with a practitioner before you attempt this. cataract. I highly recommend removing it. Add honey, molasses or stevia instead. night blindness, fatigued and watery eyes. for blurry vision, fatigued and watery eyes. Palming: Rub both hands to create heat. Close your eyes and gently place palms on each eye. sensitive so, moon gazing (indirect sunlight) could be beneficial for this condition. for patients with Retinitis Pigmentosa, even in advance cases. Please let me know if this blog helped you and what do you do to keep your vision health intact. practitioner. We are all unique individuals and not every remedy is suited for all. injuries, you can start with what you have in hand. did you consider that you could also add many natural products in addition to what you have? 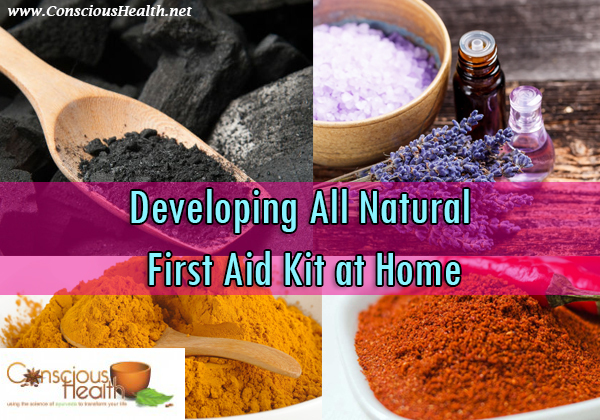 Ayurveda uses natural substances that you can prepare at home to use as first aid remedies. Why do we want a First Aid Kit? first to form a paste. home is a great way to tackle these health issues. excellent way to reduce the inflammation and itchiness. aid for bruises, pain, strains, sprains, injuries, joint and muscle issues, and swelling. inflammation and itching. It is rich in nutrients and antioxidants to heal the skin. rashes, eczema, psoriasis, damaged skin, and is popular in natural baby skin products as well. excellent remedy for diaper rash. and stomach ache. Keep a little ar of ajwain in your kit. You can also chew of the seeds. For a headache, nausea and stomach ache – if nothing is available ginger candy is a good start. boil it in water for 15 minutes. Strain and drink this water and you will get immediate relief. in relieving minor burn pain. or sprays for the hair). in a carrier oil and applying to the temples or neck, or they can be inhaled from a diffuse. applied as a chest rub when diluted in a liquid/solid carrier oil. be applied to the skin diluted in a carrier oil. creates a numbing effect due to ingredients such as Eugenio. Looking for some warmth during winter season? What about a warming cup of tea that also helps control your blood sugar? I have a healthy Ayurvedic tea recipe that you can enjoy! Mix the following herbs and spices together. Dried leaves and spices can be stored for a long period of time in a glass jar in a cool dark place. Why these ingredients? Because each one contributes certain benefits for blood sugar or health. Take a teaspoon of the Herbal mix and add it to a cup or use paper tea filters. Add hot water into the cup and cover for 10 minutes so the herbs are infused in water. Enjoy this tea 15 minutes before meals or 1 hour after meals. Please speak with your doctor if you are any medication. 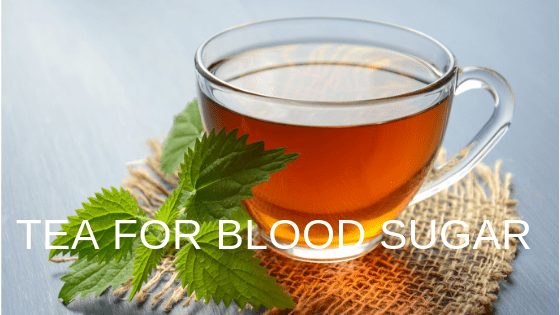 The herbs in the tea will balance erratic blood sugar levels. The tea will improve circulation and increase metabolism. It will reduce sugar and carbohydrate cravings. Taken regularly especially before meals will induce weight loss. It will reduce stress levels in the body. Holy Basil is an important and sacred Ayurvedic herb that is warming, bitter, and pungent. It is great for vata and kapha. It is not the exact same as common basil, it is more pungent and bitter, with larger leaves. It contains antioxidants apigenin, eugenol, geraniol, linalool, and flavonoids that counteract free radical damage in the body. Studies show it lowers blood sugar, delays the development of insulin resistance, and reduces lipids. It reduces the desire for sugar cravings! It may help regeneration of beta cells in the pancreas and enhances production of insulin with continual use. Fenugreek seeds and leaves have been used in Ayurveda for medicinal purposes. Fenugreek contains many micronutrients but specifically it contains a galactomannan soluble fibre which reduces blood sugar and causes satiety which contributes to weight loss. It also contains 4-hydroxyisoleucine, which increases the body’s production of insulin. Studies show it also reduces cholesterol. Fenugreek also reduces the Glycemic Index of food when eaten together. Orange peel contains pectin which is a fibre shown in studies to lower blood sugar, insulin resistance, and cholesterol. In addition, orange peel also offers vitamin C and other antioxidants, as well as a pleasant citrus scent to your tea! Ginger is an amazing warming spice used in many cultures for thousands of years. It has many antioxidants and anti-inflammatory properties. Numerous studies show it reduces blood sugar, insulin resistance, triglycerides, and cholesterol. Gingerols also increase cellular antioxidants such as glutathione and inhibits the degeneration of pancreatic beta cells (that produce insulin). Diet is very important in managing your blood sugar or diabetes. In addition to these wonderful herbs and ingredients, you can include bitter melon into your diet as well as fenugreek leaves into your food. Neem is also a great Ayurvedic herb that can be taken as a supplement capsule 15 minutes before meals, twice daily. As you can see, there are lots of natural ingredients you can use to manage your blood sugar! Caution: If you are on blood-lowering prescription medications, use with caution as it may lower your blood sugar to dangerous levels. Suanarunsawat T et al. Anti-diabetic and anti-oxidative activity of fixed oil extracted from Ocimum sanctum L. leaves in diabetic rats. Exp Ther Med. 2016 Mar;11(3):832-840. Shanmugasundaram ER et al. Possible regeneration of the islets of Langerhans in streptozotocin-diabetic rats given Gymnema sylvestre leaf extracts. J Ethnopharmacol. 1990 Oct;30(3):265-79. Persaud SJ et al. Gymnema sylvestre stimulates insulin release in vitro by increased membrane permeability. J Endocrinol. 1999 Nov;163(2):207-12. Debrup Chakraborty, et al. -Gingerol isolated from ginger attenuates sodium arsenite induced oxidative stress and plays a corrective role in improving insulin signaling in mice. Toxicol Lett. 2012 Jan 10 ;210(1):34-43. Magnesium is a mineral we should be paying more attention to! It is part of over 300 biochemical reactions and the fourth most abundant mineral in our body, with 65% of it in our bones and teeth and 35% in our brain, hearth, blood, and cells. But many of us can have low magnesium levels, and this can lead to many common symptoms. As you can see, many things affect magnesium absorption. Food processing in itself reduces magnesium, up to 80% in milling of wheat for example. Phytic acid and oxalic acid found in many greens and grains also reduce magnesium. Absorption also depends on stomach acid level, diet, and our bodily requirements. Spinach and other leafy greens – Magnesium is at the centre of the chlorophyll molecule which is the green pigment found in green vegetables. Our society focuses a lot on Calcium for bone health, but magnesium is also very important. Studies have shown that excessive calcium intake, as well as phosphorus, iron, copper, and zinc will lower magnesium absorption. Since 65% of our magnesium is in our bones, it is important for bone and teeth health. It has a structural role for bones, as well as being essential to osteoblasts and osteoclasts (bone cells), and needed for ATP (energy) formation in cells. Magnesium also is required by enzymes that metabolize vitamin D, which is crucial for bone health. Studies show that restricting magnesium intake results in osteoporosis! Magnesium relaxes smooth muscles found around blood vessels, reducing artery spasms and keeping heart rhythm regular. It also dilates blood vessels to reduce blood pressure. It works with calcium to regulate muscle tone of the heart. It is a cofactor to many enzymes, it is needed for ATP production (cellular energy), regulates ion channels, myocardial contraction, vascular tone, and thrombosis. Magnesium taurate is one form of magnesium specifically for improving cardiac function, contraction, and reducing blood pressure. Magnesium regulates muscle contractions and is a muscle relaxant. It is a great supplement for restless legs, muscle spasms, cramps, and sore muscles. It is also useful for PMS cramps and athletes who suffer from cramps. One form of magnesium: magnesium bisglycinate is a very well absorbed form. Another form, magnesium sulfate, is found in Epsom Salts, and is beneficial as a bath for muscle relaxation. Due to its relaxant function on smooth muscles around the digestive tract, it can cause loose stools especially in the Magnesium Citrate form. It is helpful when you have constipation. Magnesium also activates enzymes involved in metabolism of protein, fats, and carbohydrates. Magnesium is an anti-stress mineral, popular as a supplement before bed to calm, relax, and help you sleep. It is a natural muscle relaxant. Deficiency of magnesium results in neurological symptoms, as magnesium is important for nervous system health. In terms of supplements, it was shown that Magnesium threonate actually enters the CSF (cerebrospinal fluid) and brain, and has effects on learning and memory and is neuroprotective. Sara Castiglioni et al. Magnesium and Osteoporosis: Current State of Knowledge and Future Research Directions. Nutrients. 2013 Aug; 5(8): 3022–3033. Tangvoraphonkchai K, Davenport A. Magnesium and Cardiovascular Disease. Adv Chronic Kidney Dis. 2018 May;25(3):251-260. Jan Philipp Schuchardt and Andreas Hahn. Intestinal Absorption and Factors Influencing Bioavailability of Magnesium-An Update. Curr Nutr Food Sci. 2017 Nov; 13(4): 260–278. Chocolate is the “Food of the Gods” for a reason: it not only tastes good, but has impressive health benefits. Chocolate comes from cacao beans which are actually seeds of a fruit from the Theobroma cacao tree. It is native to Mexico, Central and South America, but now also grown in West Africa, Sri Lanka, and Malaysia. It grows well in rich tropical soil. Cacao was used by ancient civilization in Central America such as the Aztecs, Mayas, and Olmec. They used it in religious ceremonies, as currency, in beverages, and food. Columbus then brought the cacao bean to Europe but it was in the 1800s that chocolate was actually manufactured. Then various ingredients were added such as milk and sugar, turning it into modern chocolate. Raw, unsweetened cacao powder is high in antioxidants. Various brands/types vary based on the cacao bean used, the roasting, grinding, and quality. To produce raw cacao powder, the cacao seeds and surrounding pulp are fermented in boxes. Unprocessed cacao beans are very bitter due to alkaloids so they need to be fermented. The seeds are then dried in the sun or ovens and shipped to cacao processors to be milled into chocolate liquor. Then the fat (cocoa butter) is mechanically pressed to produce powder. The purest form, raw, and the least processed. It is a superfood of nutrients, including a high source of magnesium as well as zinc, iron, calcium. Cacao powder is one of the richest sources of antioxidants and there are many studies confirming the benefits of cacao powder or dark chocolate. Dark chocolate was shown to have more than double the amount of catechins than green tea which is an antioxidant superfood. A cup of hot cocoa had double the antioxidants than a glass of red wine. Cacao powder and dark chocolate contain high levels of polyphenols such as flavonols and proanthocyanins which are antioxidants. Flavonols are a class of phytochemicals found in plants. Cacao powder and unsweetened dark chocolate contains the most flavonols. Milk chocolate has less than half of its flavonols available since the milk protein binds the antioxidants, making them less absorbable. Milk chocolate also contains sugar and is more heavily processed, therefore making it less healthy. Therefore, to ensure you get the most health benefits, choose raw cacao powder or dark chocolate without additives! Flavonols protect the epithelial cells lining the arteries which produce nitric oxide that dilates the arteries, increasing blood flow and decreasing blood pressure. Dark chocolate reduces LDL oxidation (being a strong antioxidant). Lipid peroxidation is a factor in atherosclerosis and heart disease. Choosing cacao powder or dark chocolate (without sugar added) can help lower blood sugar. Studies show cacao reduces blood sugar levels and improves liver enzymes. It also helps protect against insulin resistance. Cacao consumption has shown to have an inverse relationship with incidence of diabetes. Cacao powder and dark chocolate were shown to increase blood flow to the brain and reduce the levels of stress hormones. They also improve mood and contain magnesium which is relaxing. Cacao contains tryptophan which enhances relaxation. It contains phenylethylamine (PEA) which improves memory and mood as it induces acethylcholine, dopamine, and serotonin release. Cacao contains anandamide which improves mood and anxiety. Cacao procyanidins and catechins are shown to inhibit carcinogenesis. Cacao’s antioxidants also lower free radical damage that can contribute to cancer. Cacao also reduces inflammation which is associated with carcinogenesis. Chocolate is popular in many countries, with European countries consuming half of the world’s chocolate. The Ivory Coast in Africa is the largest producer of cocoa. Cacao bean plantations employ locals to harvest the beans, dry them, and then are transported to companies. However, undercover investigations have discovered illegal child labour, therefore you should look for chocolate that is Fair Trade or organic. You can use cacao powder in smoothies, baking recipes, raw desserts, pudding, smoothie bowls, homemade ice cream, cookies, oatmeal, coffee. Try my delicious Spiced Chocolate Chip Cookies. SJ Crozier, AG Preston, JW Hurst, MJ Payne, J Mann, L Hainly, DL Miller. 2011. Cacao seeds are a “Super Fruit”: A comparative analysis of various fruit powders and products. Chem Cent J. 5: 5. Lee Hooper et al. Effects of chocolate, cocoa, and flavan-3-ols on cardiovascular health: a systematic review and meta-analysis of randomized trials. Am J Clin Nutr. 2012 Feb 1. Brian Buijsse et al. Chocolate consumption in relation to blood pressure and risk of cardiovascular disease in German adults. Eur Heart J. 2010 Jul;31(13):1616-23. Jia-Yi Dong et al. Chocolate consumption and risk of stroke among men and women: A large population-based, prospective cohort study. Atherosclerosis. 2017 Mar 4 ;260:8-12. Sansone Roberto et al. Cocoa flavanol intake improves endothelial function and Framingham Risk Score in healthy men and women: a randomised, controlled, double-masked trial: the Flaviola Health Study. Br J Nutr. 2015 Sep 9:1-10. Maria Monagas et al. Effect of cocoa powder on the modulation of inflammatory biomarkers in patients at high risk of cardiovascular disease. Am J Clin Nutr. 2009 Nov;90(5):1144-50. Dirk Taubert et al. Effects of low habitual cocoa intake on blood pressure and bioactive nitric oxide: a randomized controlled trial. JAMA. 2007 Jul 4;298(1):49-60. Zubaida Faridi et all. Acute dark chocolate and cocoa ingestion and endothelial function: a randomized controlled crossover trial. Am J Clin Nutr. 2008 Jul;88(1):58-63. Sheng Yuan et al. Chocolate Consumption and Risk of Coronary Heart Disease, Stroke, and Diabetes: A Meta-Analysis of Prospective Studies. Nutrients. 2017 Jul 2 ;9(7). Fei Gong et al. Chocolate Consumption and Risk of Heart Failure: A Meta-Analysis of Prospective Studies. Nutrients. 2017 Apr 20 ;9(4). Susanna C Larsson et al. Chocolate consumption and risk of myocardial infarction: a prospective study and meta-analysis. Heart. 2016 Jul 1 ;102(13):1017-22. Georgina E Crichton et al. Habitual chocolate intake and type 2 diabetes mellitus in the Maine-Syracuse Longitudinal Study: (1975-2010): Prospective observations. Appetite. 2017 Jan 1 ;108:263-269. Chisa Matsumoto et al. Chocolate consumption and risk of diabetes mellitus in the Physicians’ Health Study. Am J Clin Nutr. 2015 Feb ;101(2):362-7. Kang N, et al. Cocoa procyanidins suppress transformation by inhibiting mitogen-activated protein kinase kinase. 2006. J Biol CHem. 283(30): 20664-73. Yamagishi M, et al. Chemoprevention of lung carcinogenesis by cacao liquor proacthocyanidins in a male rat multi-organ carcinogenesis model 2003.. Cancer Letters. 191(1): 49-57. Neem is an amazing Ayurvedic herb used for thousands of years for inflammation, infections, antioxidant support, dental health, and skin health. It is a tall tree (Azadirachta indica) in the Mahogany family native to India and Burma but now also in the Caribbean and South America. There are millions of neem trees in India and surrounding countries, found in areas like road-sides and backyards. Neem oil is obtained from the seeds within the fruit. The kernel contains up to 50% oil. More than 100 constituents have been isolated from the neem tree, and all the parts are used medicinally: leaves, flowers, seeds, fruits, twigs, roots and bark. Traditionally, neem is a valuable herb used medicinally by local populations. This practice has continued into modern times. Neem twigs have been used for centuries to clean teeth as natural toothbrushes. Studies in Germany have shown that neem extract prevents tooth decay and is anti-inflammatory on the gums. It helps reduce the risk of periodontal disease and studies show it inhibits bacteria that’s involved in creating cavities. Neem is now added to more toothpastes and you can do an infusion of neem leaves to use as mouthwash. I love neem so much that I made my own Tooth Powder with Neem! Neem is antibacterial, antiviral, and healing agent, thus it is great to have as a first aid option. Cuts and wounds – Apply oil, or wash with neem soap. It increases blood flow and helps heal. Neem has shown in studies to inhibit various microorganisms that cause diseases. It is antimicrobial against food-borne pathogens such as Staphylococcus aureus/pyogenes, E. coli, Listeria monocytogenes, Bacillus cereus, and Salmonella, as well as various gram-negative bacteria. It kills sandflies causing Leishmaniasis. It inhibits the malaria parasite and chloroquinine-resistant malaria and reduce transmission of malaria. It is used to treat cholera and diarrhea especially traditionally in India. It inhibits Dengue virus. It reduces Chagas disease which affects millions of people in developing countries. Neem has many skin benefits and applications. You can use neem oil, soap, cream or bath for healing eczema and psoriasis, while reducing inflammation. Neem lotion is good for dry skin and wrinkles. Neem in shampoos and hair products helps reduce dandruff, scaly flakes, and heal scalp issues. Neem is used in mosquito repellants and kills lice. Neem soap or cream is used to reduce acne and reduce acne-causing bacteria. You can do a neem powder paste for your hair as a hair mask to promote hair growth and quality. Neem is a bitter herb! Bitters have many digestive benefits, including stimulating digestive juice secretions, detoxifying the body, are antimicrobial, and support the liver. Neem is also anti-inflammatory and helps against inflammatory bowel disease and ulcers. Neem is a bitter herb, and like other bitters, it is known to support the liver detoxification pathways. It cleanses the blood and skin through its cooling properties (cooling pitta skin inflammation), removing toxins, providing antioxidant support, and supporting the immune system. There are many studies showing anti-cancer effects of neem preparations and extracts. It works on various aspects of cancer such as antioxidant defenses, inhibition of proliferation, modulating various cell signaling pathways, tumour suppressor genes (e.g., p53, pTEN), angiogenesis (VEGF), transcription factors (e.g., NF-κB), and apoptosis factors (e.g., bcl2, bax). I encourage you to get more neem into your life! Whether it is through herbal supplements or external uses, I’m sure you can benefit from its healing properties. Udeinya IJ, et al. Fractions of an antimalarial neem-leaf extract have activities superior to chloroquine, and are gametocytocidal. Ann Trop Med Parasitol. 2006. 100(1):17-22. Prashant GM, et al. 2007. The effect of mango and neem extract on four organisms causing dental caries: Streptococcus mutans, Streptococcus salivavius, Streptococcus mitis, and Streptococcus sanguis: an in vitro study. Indian J Dent Res. 18(4):148-51. Abdel-Ghaffar F, Al-Quraishy S, Al-Rasheid KA, Mehlhorn H. 2011. Efficacy of a single treatment of head lice with a neem seed extract: an in vivo and in vitro study on nits and motile stages. Parasitol Res. Harish Kumar G, et al. 2009. Nimbolide a limonoid from Azadirachta indica inhibits proliferation and induces apoptosis of human choriocarcinoma (BeWo) cells. Invest New Drugs. 27(3):246-52. What emotions do you get when you inhale the floral scent of roses? What memories, thoughts, and feelings are triggered? Many aromatic plants such as roses contain essential oils, which are volatile oils that enter the body and trigger various effects. They are commonly inhaled or absorbed through the skin. Inhalation of essential oils carries the molecules to the limbic system in the brain which includes the hippocampus, amygdala, and hypothalamus which are involved in various behaviours such as memories, arousal, emotions, learning, desires, and appetite. Rose is a symbol of love and romance. Rose hips which are the berries under the petals. They are rich in vitamins, minerals and fatty acids, polyphenols, carotenoids and tannins. The vitamin C content of rose hips is higher than citrus fruits. Rose is not an easy oil to diffuse and requires a lot of raw material harvested at the right time. About 4000 pounds of roses yields 1 pound of essential oil. This makes it an expensive oil. There are different varieties of rose from around the world that are used to make the oil. Commercial rose oil usually comes from two rose species: damascena (Damask rose) and centifolia. Bulgaria and Turkey are the main producers of R. damascena essential oil. In Ayurveda, rose products were used as astringents, cooling agents, mild laxatives, and antibacterials among many other uses. Rose oil is also commonly added to the skin, diluted in a carrier oil (Eg. almond, jojoba, sesame oil etc) or as part of skin care products and massage oils. Constituents: These vary based on the species and growth conditions. Main ingredients are: citronellol, citral, carvone, eugenol, phenyl geraniol, linalool, a-pinene, b-pinene, a-terpinene, limonene. Rose essential oil has anti-seizure effects, probably due to the flavonoids that have affinity to the GABAergic system in the brain. Rose essential oil shows protection against induced neuronal cell death. It also protects against aluminum-induced neurotoxicity. Rose is common in perfumes. It is a symbol of love and romance. The scent stimulates desires, evokes romantic feelings, and boosts libido. Rose essential oil stimulates hormonal secretions which can then trigger menstruation for those who are suffering from irregular cycles. Rose essential oil eases cramps, nausea, and fatigue, relieving pain of PMS. One study with rose essential oil showed daily massage caused improved psychological, physical, social, and reduced PMS symptoms. Rose is common in face creams especially for mature skin as it helps against wrinkles as well as dry skin. It is also an antioxidant that counteracts free radical damage that ages skin. Rose essential oil is antibacterial due to ingredients such as citral, nerol, and farnesol. It has shown activity against many bacteria. It has citronellol (also in citronella) which is a mosquito repellant. There are many natural skin care products that have rose essential oil. The popular Weleda products have a rose renewing facial care line. Andalou has a rose line that uses rose stem cells and rosehip oil. Dr. Hauschka has had the Rose Day Cream since the 1960s. Of course you can also buy rose essential oil and rosehip oil in many health food stores. You can also make your own products using these oils! In a double boiler, gently melt the shea butter and coconut oil. Add avocado oil. Remove, add to a bowl and let it cool down until it is not liquid anymore. Mix in the rose oil. With a hand mixer, whip it until it is fluffy. Store in a cool place (otherwise it may melt again). In a bowl, add flour and slowly mix in water stirring until a paste is formed. Add rose oil and mix. Rub onto the face and the wash away with water. In a storage jar/container, mix the oils. Massage the body regularly. And I have some exciting news! I am currently working on an Ayurvedic Aromatherapy e-course that is detailed and comprehensive. It is organized into 12 modules that teaches you everything you need to know about Aromatherapy, and Ayurveda uses essential oils to balance doshas. You get a Materia Medica on dozens of essential oil, properties, and usages. You get all the health benefits of each essential oil organized per body system, based on research. You also get lots of DIY recipes with essential oils. This is a wonderful resource to have (for life!). Hafiz Majid Rasheed et al. Chemical Composition and Vasorelaxant and Antispasmodic Effects of Essential Oil from Rosa indica L. PetalsEvid Based Complement Alternat Med. 2015; 2015: 279247. Shinohara K et al. Effects of essential oil exposure on salivary estrogen concentration in perimenopausal women. Neuro Endocrinol Lett. 2017 Jan;37(8):567-572. Mahboubi M. Rosa damascena as holy ancient herb with novel applications. J Tradit Complement Med. 2015 Oct 30;6(1):10-6.